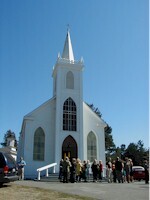 Wedding guests linger outside the church on a fall afternoon. Constructed of redwood in 1859 by New England ship's carpenters on land donated by Jasper O'Farrell, the church has served this coastal community continuously for over a century. Father Louis Rossi was appointed pastor on March 8, 1860, and Archbishop Alemany dedicated the curch on June 2, 1861. The church was also featured in Alfred Hitcock's 1963 file The Birds.